The Pig Club are back with a one night special dinner, exploring (& eating) the humble goat, with chefs Fabiana Reis and Sean Hegarty. The dinner takes place near London Fields on Thurs 17th October, and there's even a ukulele performance after the meal. "The Pig Club chefs are happy to present its next pop up restaurant “EVERYTHING ABOUT THE KID”. Fabiana Reis and Sean Hegarty will be serving a creative wild menu exploring the versatility of the goat’s world including what it munches on, its bi-products and the goat itself. We’re also delighted to bring ingredients like marsh herbs, leafy green vegetable, and the super food berry sea buckthorn to our diners’ plate. They are part of the goat’s diet and slowly becoming more and more popular in the UK’s restaurants. Expect great textures and surprising tastes. 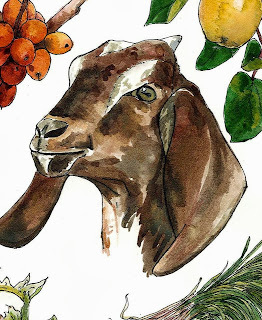 Our Kid comes straight from the farm Cabrito, located in Somerset where visionaries chef and farmer combined their experience to bring British goat to the country’s menu. The Pig Club totally supports the idea. Fabiana is a chef de partie at the Islington ethical pub Duke of Cambridge and founder of the Pig Club. Sean has over 25 year of cooking experience having had worked as a personal chef for Samuel Jackson as well as being the owner of a bistro in Kent. He has also worked as chef for the Duke of Cambridge and now develops cooking projects around London. The after dinner treat will be performed by Stephanie Ware, the Ukulele Lady! Quince Tart with goat's curd cream"